Working side-by-side with his son, Joshua, playing golf, traveling with his wife, and walking his dog. Robert (Bob) Graham has been serving families in Zanesville, Ohio, Muskingum County, and surrounding communities for over 40 years. He says he had no better reason to join in the practice of law beyond a desire to follow in his family footsteps. This love of and loyalty to his own family also drives him to help other families that need supportive legal counsel in issues that range from planning their estates and marital terminations to custody disputes, adoptions, and more. In the area of estate planning, Bob gets to know his clients, their families, and their goals. He crafts estate plans—wills, medical directives, and trusts—that simplify the effect of death by reducing probate expense and address potential inter-family conflict while keeping the individual’s wishes intact. 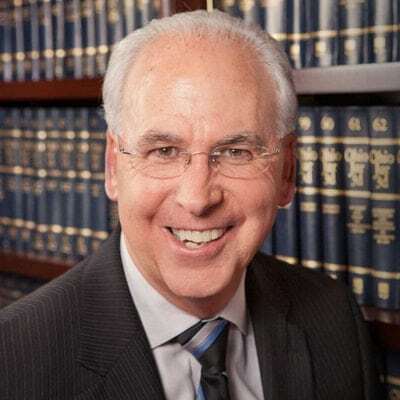 In family law, Bob brings his experience to bear on ensuring the security of his clients and their children, whether in adoption, child custody, or marriage termination through divorce or dissolution. He says that in addition to helping people work through their problems, one of the most gratifying aspects of his family law practice is the number of referrals he receives from his clients. Family law matters can be extremely disruptive and emotionally draining on everyone—parents, children, extended family, and friends. Bob conveys both a passion for the work and compassion for the people he serves. In many cases, his clients span generations. Bob receives many client referrals because he cares, but also because he is a smart lawyer when it comes to addressing the needs and resolving the problems that face families. Among his greatest strengths is his ability to focus on the relevant facts of a case, not just the emotional issues that consume his clients. Key in his work is designing the “theme of the case,” such that the evidence and the law force the judge into a position that feasibly supports his client’s goals. He knows the law and builds the proof. He strives to paint the judge into the appropriate corner where the court must hang its hat and generally rule in his client’s favor. Good judges want good lawyering. They count on the attorney to present enough proof to “do right” by every family, and Bob delivers. Bob’s clients are very special to him, and he frequently develops lifelong friendships through his professional relationships. His involvement with his clients also reaches into the community, which includes years of volunteer service. Among his charitable activities are hospice fundraising and serving on the boards of the Sheltered Workshop for the developmentally disabled and the local food and clothing bank. Bob is also active in his church community.